Kowa's Portable Slit Lamp is now LED light-based! The SL-17 weighs less than 800g and provides easy and versatile operation with a choice of 10x and 16x magnifications, 3 slit widths* (0.1mm, 0.2mm, 0.8mm) plus spot illumination and a cobalt blue filter using a high illumination LED as the light source. The cobalt blue filter is useful for foreign body and contact lens applications. The SL-17 has a rheostat controlled light source from 0 to 20,000 Lux. The LED light source provides a much whiter light than ordinary halogen light sources found on competitive instruments. 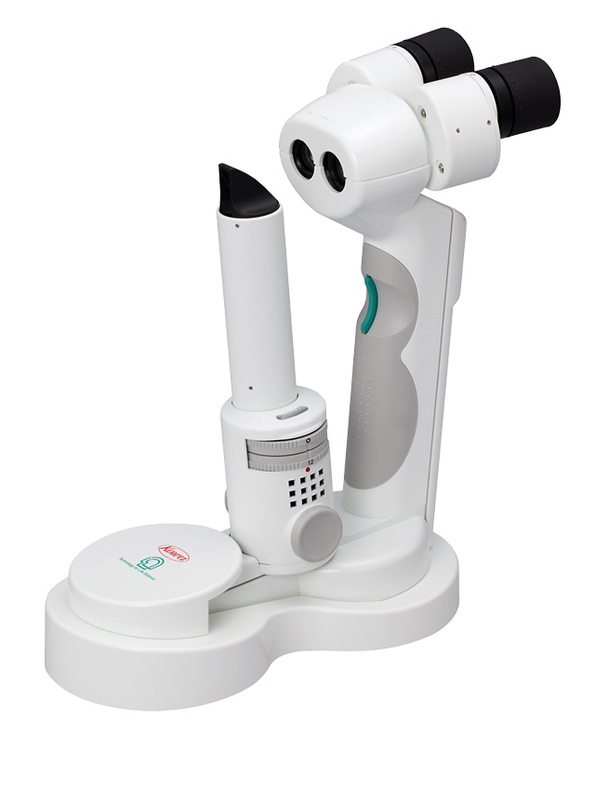 The SL-17 is compact and portable making it the ideal instrument for domiciliary environments, mobile evaluations, pediatrics, and patients not able to be imaged by a traditional slit lamp. The SL-17 is especially useful in emergency rooms where patient mobility is a challenge, or when switching between consultancy rooms is necessary. Offering cordless operation, the SL-17 is powered by (4) AAA rechargeable or dry cell batteries to provide long lasting, continuous operation of the extra-bright LED lamp. Illumination is thumb wheel controlled and illuminated for easy viewing in a darkened room.